UPDATE: The Symphonic Wind Ensemble concert scheduled for Sunday, April 15, at 3:15 p.m. has been cancelled. We will make plans for an alternate performance at a future date. The Ripon College Symphonic Wind Ensemble will perform at 3:15 p.m., Sunday, April 15. This will be the first concert held in the newly renovated Demmer Recital Hall in C.J. Rodman Center for the Arts. 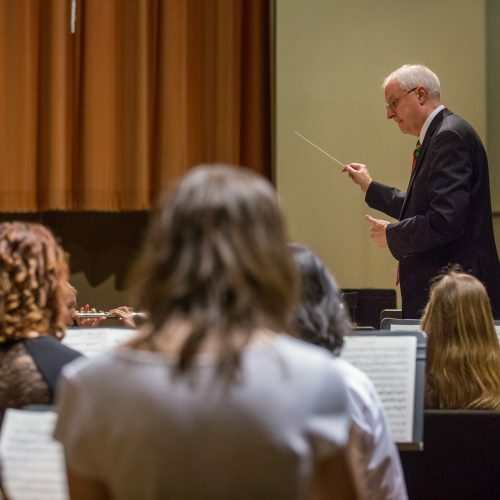 Professor of Music Kurt Dietrich is the conductor, and Kate Myszewski ’19 of Appleton, Wisconsin, will conduct one selection. The musical selections for the program will feature Gustav Holst: Second Suite in F; Richard Saucedo: Song of the Gandy Dancers; Alfred Reed: The Hounds of Spring; Vaclav Nelhybel: Chorale; Frank Ticheli: Rest; and John Philip Sousa: The Fairest of the Fair. “The Holst Suite is one of the all-time classics of band literature. The pieces by Saucedo and Ticheli are contemporary works. The Nelhybel and Reed works are well-loved standard repertoire from the 1960s and 1980s, respectively,” says Dietrich. Trumpet: Robert Booty, Ben Ermatinger ’18 (Ripon, WI), Efrain Garza ’18 (Denmark, WI), Dennis Jaeger ’20 (Waupun, WI), Katherine King ’19 (Farmington, MN), Joshua Schubring ’18 (Franklin, WI), and Cordell Walker ’18 (Ripon, WI). Horn: Rebecca Brunstad ’19 (Menomonie, WI), Megan Pieper ’18 (Eagle, WI), and Jonathan Simpson. Posted April 15, 2018 in Fine Arts, Student, Uncategorized by Melissa Anderson.